On June 21, 2016, the FAA issued its long-awaited final rule, 14 CFR part 107 (Part 107), for integrating small unmanned aircraft systems (UAS) into the U.S. airspace. [i] Part 107, which changed little from the proposed rule issued in February of 2015, paves the way for the widespread use of small commercial unmanned aircraft. The new rule, which will be effective August 29, 2016, is good news for agriculture. In the FAA Modernization and Reform Act of 2012 (Public Law 112-95, Sec 336), Congress directed the FAA to develop and submit a comprehensive plan to safely accelerate the integration of unmanned aircraft into the national airspace by September 2015. Part 107, while nearly a year late, accomplishes this directive. Part 107 was needed because under current law, any aircraft not meeting the definition of “model aircraft” must be registered, granted an airworthiness certificate, flown by a licensed pilot, and given operational approval. These regulations applied equally to small unmanned aircraft flown for commercial purposes, essentially prohibiting their use. In early 2015, FAA began streamlining a special exemption process to allow some commercial UAS to begin flying. The Section 333 exemption process (authorized under the FAA Modernization and Reform Act) allowed for the granting of special permission for applicants to commercially fly small UAS on a case-by-case basis. In January of 2015, the FAA had granted 13 such exemptions. At the time the new rule was issued, that number had risen to more than 5,500. Part 107 provides that anyone operating under a Section 333 exemption may continue to do so, even after Part 107 is effective. Nonetheless, the requirements of Part 107 are less restrictive. To retain the certificate, the remote pilot would be required to pass a test every two years. The FAA has already placed detailed instructions for would-be remote pilots on its website. It estimates that it will be able to issue a temporary remote pilot certificate within 10 days of receiving a completed application. Part 107 applies only to UAS weighing less than 55 pounds. Standard airworthiness certificate requirements continue to apply to larger unmanned aircraft. Similarly, aircraft meeting the definition of model aircraft are not subject to the Rule; however, all model aircraft must be flown in a safe manner. Violators are subject to FAA enforcement actions. Part 107 eliminates the need for an airworthiness certificate for small UAS, but requires the pilot to conduct a pre-flight check to make sure that it’s in a condition for safe operation. The aircraft must also be registered by the FAA and properly marked, as announced last December. Part 107 requires that a person other than the certified remote pilot may operate the controls of the UAS, as long as he or she is under the direct supervision of the remote pilot. This means that the remote pilot is on the ground, ready and able to take the controls at any time. It also means that the remote pilot can supervise only one unlicensed operator at a time. Both the operator and the remote pilot must keep the aircraft within their visual line of sight at all times. This visual line of sight must be accomplished through unaided vision. However, glasses or contacts are allowed. An operator may use a visual observer who is in communication with the operator to “supplement situational awareness.” However, visual observers are not required. The operator cannot fly the aircraft over people not directly participating in the operation. Nor can the operator fly the aircraft inside of a covered structure. Of course, the operator must also remain clear of other aircraft. Remote pilots may operate their UAS in uncontrolled airspace without prior permission; however, if they wish to fly in a controlled airspace (such as near an airport), they must obtain prior permission from air traffic control. Although the proposed rule required daylight-only operations, Part 107 allows for “civil twilight” operations as well. This means that the aircraft may be flown 30 minutes before the official sunrise or 30 minutes after the official sunset, as long as appropriate anti-collision lighting is employed. Part 107 allows the remote pilot to fly the aircraft at a maximum altitude of 400 feet above ground, unless within 400 feet of a structure (and then not more than 400 feet above that structure). The operator may not exceed a groundspeed of 100 miles per hour. The FAA notes in Part 107 that it the new rule was created to allow for the immediate integration of the "safest" types of flights into the airspace. The agency recognizes, however, that some operations that could be conducted in a safe manner are not authorized by Part 107. Consequently, those wishing to engage in such operations may apply for a "certificate of waiver" to deviate from certain restrictions, so long as the FAA administrator finds that the operation can be “safely conducted” outside of those parameters. 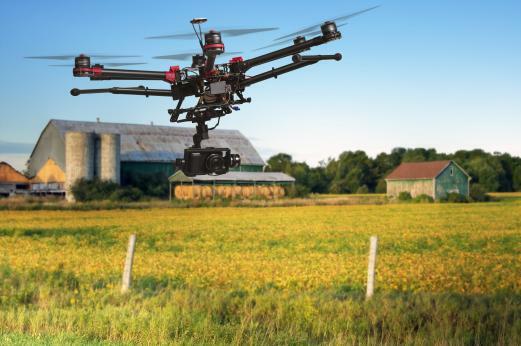 The waiver process should allow flights, for example, outside of visual range in unpopulated areas for specific purposes such as crop scouting. With the new Rule will come many new “eyes in the sky.” States will likely respond with new laws enhancing current privacy and trespassing laws to accommodate the new traffic. [i] In conjunction with the new Rule, the FAA issued guidance through Advisory Circular 107-2.